The trio C.AL.MA. 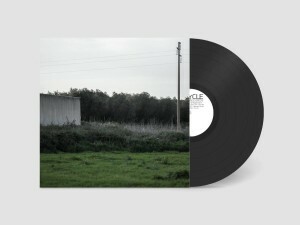 celebrates their love for Chicago house and techno from Detroit with groovy and fresh tracks; the EP includes a slamming remix by Coffee Pot (LIMO + Guido Nemola). Party girl grows from a a collaboration between 2 artists coming from different fields in music. 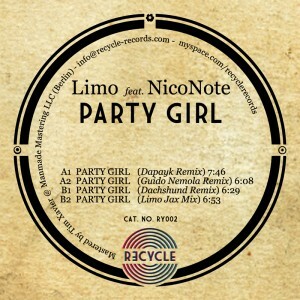 NicoNote brought her Voice and Indie-Soul Stylings to Limo’s Club Production Sound. The release is completed with hot remixes by Dapayk, Guido Nemola and Dachshund. This simply but very Cute and intense Spleen made Party girl be here! Enjoy ! JUN AKIMOTO: cool release! ful support! MOTOR CITY SOUL: Dachhund remix sounds like a perfect tech tool, looking forward to trying this one out! KIKO MARTINEZ: very good music… nice vibes! ALLAND BYALLO: Dachshund and Nemola remixes are super, especially the former. DANIEL SANCHEZ: damn fine ep here!, i like the dapayk and the dachshund remixes a lot! FEYGIN: great remix from Limo Jax .. vocal is lovely..
ECHONOMIST: Guid Nemola and Dachshund are surely my favorites!!! DZETA N’ BASILE: Nice journey in the Guido Nemola mix! Support from us! LUCIANO ESSE: Dachsund rmx is the bomb! YAYA: Nemola remix is cool! my favourite. Thanks. FLORIAN KRUSE: pure groove by Dapayk! digging it! LUKAS GREENBERG (PLASTIC CITY RADIO SHOW): support!! HERMANEZ: will check it out ! thanks ! MIRCO VIOLI: Dachshund remix is great !!! MIHAI POPOVICIU: dachsund remix for me, nice one! SOMEONE ELSE: Dapayk mix is nice. COSMIC COWBOYS: Limo Jax Mix for us! !